Marie Prange Oetting had a life-long involvement with the American Youth Foundation and embraced the timeless mission of balanced living and best self as an integral part of her life. 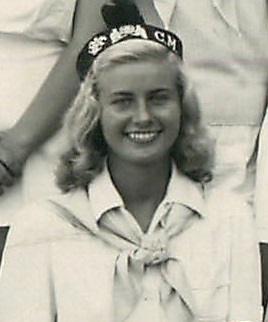 Her first experience was as an Older Girls camper at Miniwanca in Shelby, Michigan from 1943 to 1946. She returned as a leader from 1945-48 and joined the Older Girls staff in 1965 and 1969. She remained closely connected, involved and supportive of the AYF throughout her life, serving as a member of the Board of Directors up to the present. Marie passed away on Tuesday October 9, 2018, at the age of 91. Marie was a compass-bearer for the American Youth Foundation. Thanks to her generosity, many youth became campers or attended the National Leadership Conference. Marie has left an indelible mark and has impacted so many in the AYF community throughout her lifetime. As an organization, we will sorely miss her bright light and the joy and hope she exuded through her zest for life. We are grateful for the many ways she shaped and inspired the work of the American Youth Foundation. Marie Prange Oetting at Miniwanca, 1946. Read her full obituary in the St. Louis Post-Dispatch here. Services: Funeral will be held on Monday, November 19th at 10:30 am at the Ladue Chapel Presbyterian Church, 9450 Clayton Rd, Ladue.